Proso millet is one of the healthiest and delicious small, starchy grain that pale yellow or whitish in color. 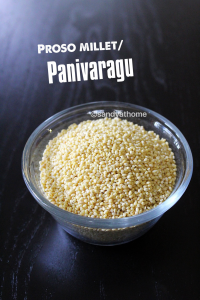 Proso millet/ broom corn millet is called Panivaragu in Tamil / Barri in Hindi / Varigulu in Telugu / Baragu in Kannada. Call it any name it has rich source of dietary fiber, vitamin B, protein, calcium and magnesium. 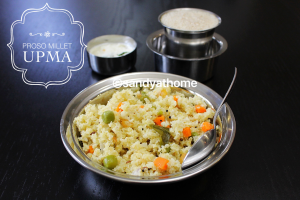 So much goodness from one millet/ grain so why not add it our diet? So lets add it in our diet in the form of simple and quick to make delicious upma. 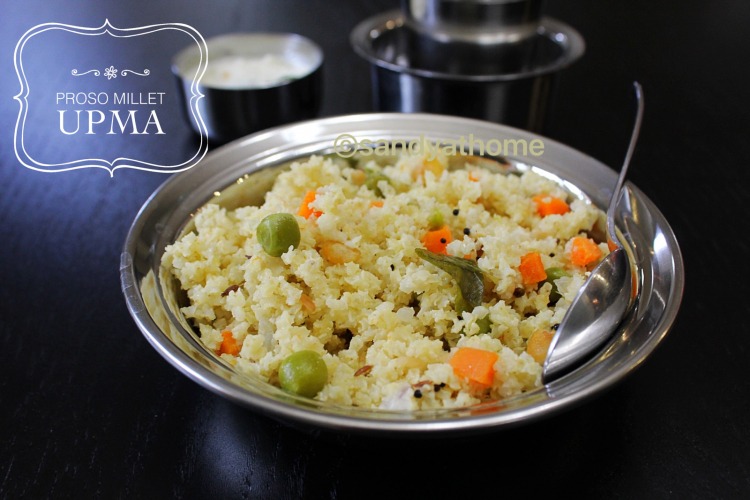 This proso millet upma can be easily made in pressure cooker in jiffy and give a healthy start to your day. 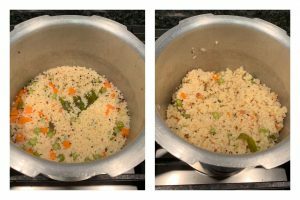 I added few veggies like carrot and peas to make it mire healthy and delicious also colorful which can be skipped too as the upma is itself healthy. 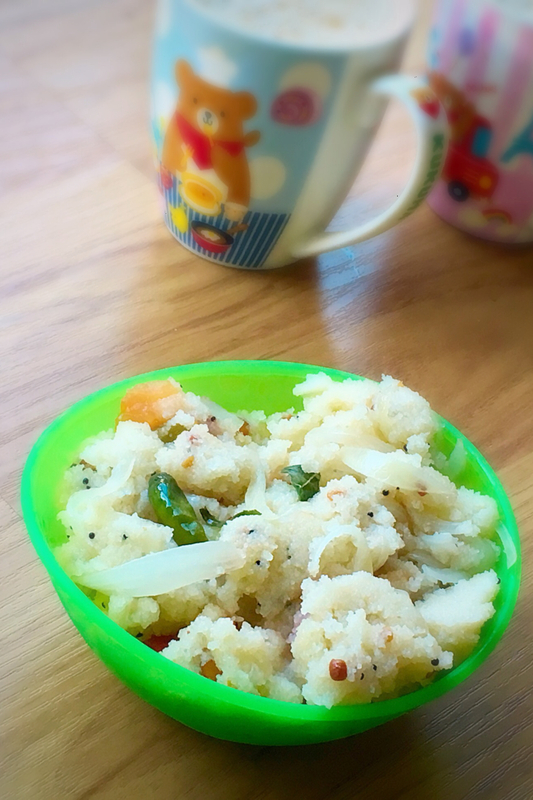 Serve it with simple chutney or sambar for breakfast/ dinner! So lets get to the making! 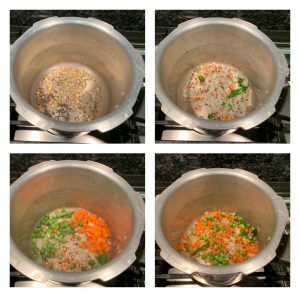 Wash and soak proso millet for 10 minutes.Chop onion finely, chop carrot and green chilli. Now heat oil in a pressure cooker add mustard seeds, after it splutters add urad dal and channa dal, when it turns golden brown add curry leaves, chopped onion and green chilli. Saute well until onion. Now add chopped carrot, peas and salt. Mix well and saute all the veggies for a minute. When the veggies look sauteed add 2 cups water and soaked proso millet. Mix well and pressure cook for 3 to 4 whistles or until done. 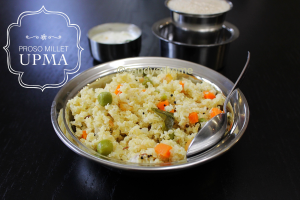 When the pressure subsides open the lid and give the upma a gentle mix. Serve it hot with chutney and sambar. 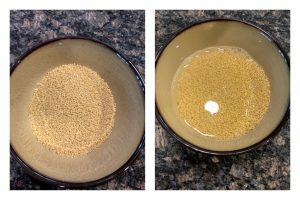 Wash and soak proso millet in water for 10 minutes. Chop onion finely, chop carrot and green chilli. Now heat oil in a pressure cooker add mustard seeds, after it splutters add urad dal and channa dal, when it turns golden brown add curry leaves, chopped onion and green chilli. Saute well. Now add chopped carrot, peas and salt. Mix well and saute all the veggies for a minute. When the veggies look sauteed add 2 cups water and soaked proso millet. Mix well and pressure cook for 3 to 4 whistles or until done. 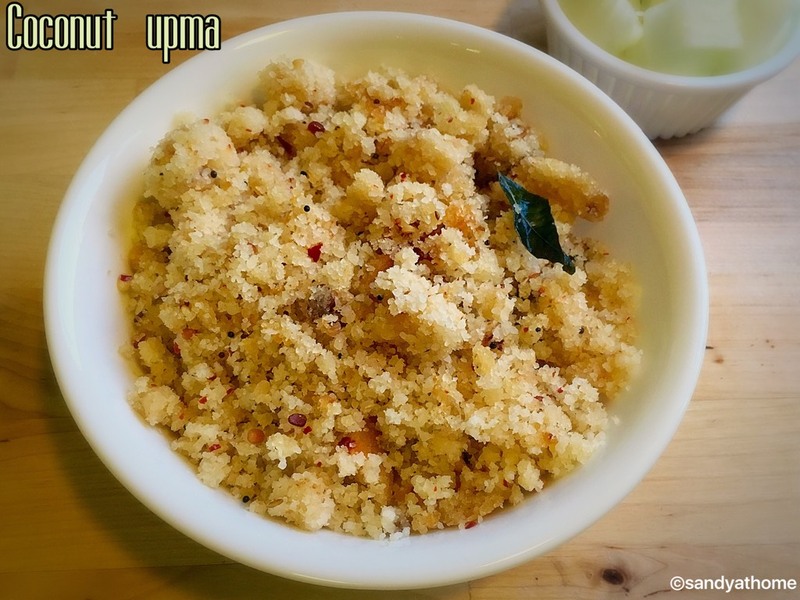 When the pressure subsides open the lid and give the upma a gentle mix. 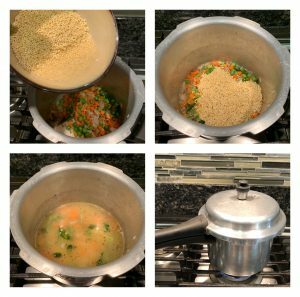 (When done the millets puff up Serve it hot with chutney and sambar.